Gladiolas by Maria Sherbina ~ Maria Sherbina has a special way of combining color and light in her floral still lifes painted in her Eastern European studio. 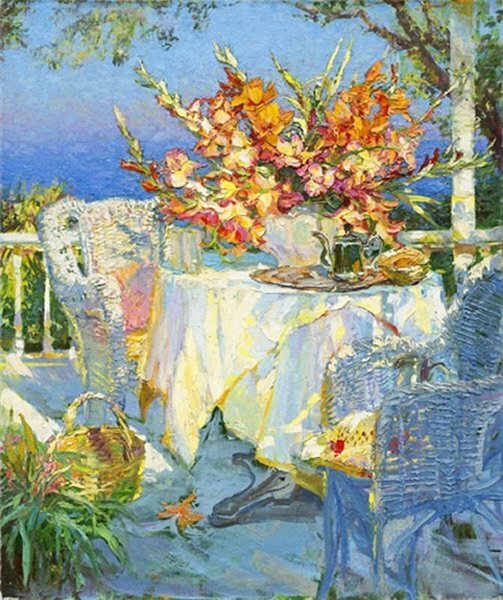 In "Gladiolas", she combines cool, deep ocean blues with sunny yellows, salmon pinks and touches of orange in a sophisticated composition that invites every viewer in. Who wouldn't want to spend the afternoon on the terrace, overlooking the ocean with such beautiful flowers and warm sunlight?